English writer; born at Portsea 1819; died at Birmingham 1873; daughter of Joseph and Amelia Moss of Portsea. At the age of eighteen Celia, in conjunction with her sister Marion, published a volume of poems bearing the title "Early Efforts. 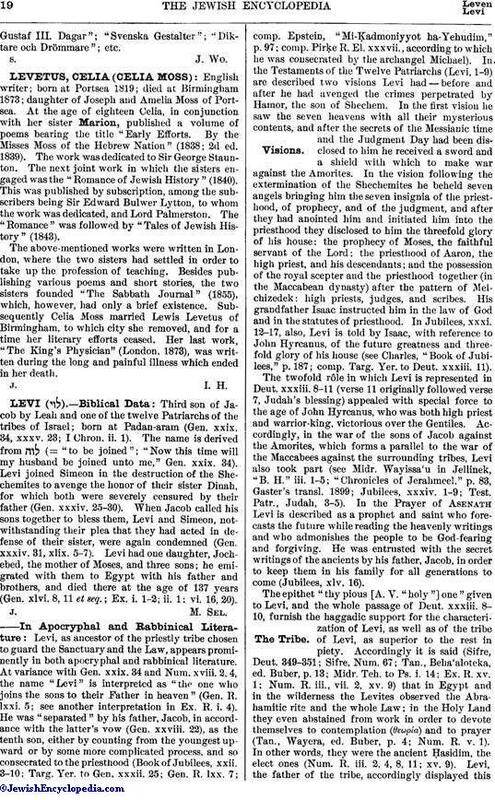 By the Misses Moss of the Hebrew Nation" (1838; 2d ed. 1839). The work was dedicated to Sir George Staunton. The next joint work in which the sisters engaged was the "Romance of Jewish History" (1840). This was published by subscription, among the subscribers being Sir Edward Bulwer Lytton, to whom the work was dedicated, and Lord Palmerston. The "Romance" was followed by "Tales of Jewish History" (1843). The above-mentioned works were written in London, where the two sisters had settled in order to take up the profession of teaching. Besides publishing various poems and short stories, the two sisters founded "The Sabbath Journal" (1855), which, however, had only a brief existence. Subsequently Celia Moss married Lewis Levetus of Birmingham, to which city she removed, and for a time her literary efforts ceased. Her last work, "The King's Physician" (London, 1873), was written during the long and painful illness which ended in her death.